Myrna Loy and William Powell are one of the greatest on screen couples of all time. So great, in fact, they were partnered in fourteen films! 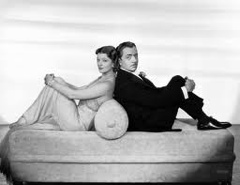 I fell for their chemistry in The Thin Man movies. Their romances feel so believable and effortless, so attainable. Recently, I grabbed up The Great Zeigfeld (1936) from a bargain bin. This film has zest, glitter, great music, humor, and a beautiful story all lead by Powell as Florenz Ziegfeld and accompanied by Mrs. Loy as Billie Burke. The Great Zeigfeld is now one of my favorite movies, if for no reason other than, the scene where Flo and Billie are sitting by the river. It makes my heart flutter as this is how I see love. My love. It’s everything I want. We are half way into January and many people I know are fumbling through their resolutions. This is why I don’t usually commit myself to such things. However, this year, I have decided to make a few. They are more of a lifestyle change as opposed to a resolution to be broken. • Find a true focus for my blog. -I dabble in a bit of this and a bit of that. I’ve not quite nailed down “my place” in the blogosphere. I love the vintage life, but I’m always excited to share my knowledge on many topics. Either way, I would like to blog on a schedule. We’ll see. – I am an artist at heart. My interests in art are quite varied and constantly changing. Vintage is an art, and one of my passions, but I paint, sew, craft, write, cook & bake, take photos….and I’m sure a few other things. I seem, however, to neglect actually finishing most projects I begin, leaving a trail behind me as something new catches my eye. I want to complete something and feel the thrill of that accomplishment. – Yes, this hopefully will result in weight loss, as my weight is currently unhealthy for my height. (According to IBW scale I should be around 98-112lbs…I laugh) But essentially, it’s just go to the gym, have a set sleeping schedule & watching my portions. I have a bodymedia armband, and when I was using it I LOVED it. I’ll try to get a post out this weekend on that. • Take more photo & get prints. – I thoroughly enjoy photography, yet I neglect to frame any, they just live as memories on my computer. I want to surround myself with images of the people and life I love. I think those are all reasonable and attainable. In the coming months, I’ll update as to my progress. Today has been a good day. In fact, really everyday i wake up is a good day. I got to wake up in the arms of the man I love, the man who loves me. All I could think is what a lucky, lucky gal I am. Got my hair done by a girl who was so excited to do a “cool hairstyle” in the midst of a bunch of little old lady styles, and she totally aced it! Plus she had me show her how to do eyeshadow like mine, but she didn’t think she was brave enough to really wear it. I gotta say, if I were in the beauty industry, I would rock my look all the time….but the hospital frowns on it. I don’t know how trusting I would be with an RT who had pink hair. I’m such a domestic girl, I love wearing aprons and doing house work. Cooking, cleaning, ironing….these things make me happy. I just finished prepping every thing for dinner, all thats left is too pop it in the oven about an hour before Thomas comes home. It’s a new recipe…but I’m stoked about it. Cranberry chicken. We’ll try it out and i’ll review it. I LOVE retro recipies. I haven’t had Christmas yet. If this weather will give me a break, I might be able to. I’m also in the middle of working on some aprons. I need a few new ones (One can never have too many aprons) and one for one of my favorite girls, H. EXCEPT…I can’t figure out my sewing machine. How embarrassing is that? So I guess when I do make it back to see my family for a belated Christmas, I’ll take it back down there with me, and have Mother show me again how to wrap and wind my thread about the little hooks. I’m fixing to get started on cleaning the house again, then work out, shower…and by that time, it’ll be time to get on dinner, set the table and get dressed and ready for Thomas to get home. I hope, dear readers, that you find as much joy the “simplistic” things in life and really take the time to cherish those around you. I am in a rare state today. I don’t know whether I am up or down….but what I am sure of is that i am happy. This “happy” is terrifying and beautiful all at once, and as much as I enjoy it I am ignorant of how to proceed. The most mundane of things even seem somehow more magnificent. I think this is what one might call being absolutely in love.